Naval Station Mayport is the Navy's third largest fleet area in the US and home to the US Fourth Fleet. The base is located in the Jacksonville, Florida area. 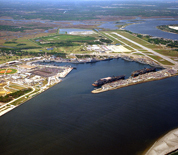 Mayport's harbor can accommodate 34 ships of carrier-size and its airport, David L. McDonald Field, has an 8,000 ft runway. Four helicopter squadrons are stationed at NS Mayport - HSM-40, HSM-46, HSM-48 and HSL-60. Vessels at Mayport include USS Carney, USS Roosevelt, USS Farragut, USS New York and USS Iwo Jima, among others. This NS Mayport directory features the critical info you’ll need to navigate through the many facilities and recreational opportunities available on base.